Since the cast was rounded up last year, we've been waiting to get a first look at the drama The Devil's Knot, the dramatization of the tragic injustice suffered by the West Memphis 3, a trio of teens wrongly incarcerated for 18 years after being convicted of the murder of three younger boys. Peter Jackson presented this tale of injustice in the documentary West of Memphis, but the film from Atom Egoyan brings Colin Firth, Reese Witherspoon, Amy Ryan, Dane DeHaan, Stephen Moyer and Mireille Enos together to tell the unbelievable story. Now we have the first photos of Firth private investigator Ron Lax, who was the first pro bono supporter of the defendants as they headed into their first trial. Look below! The man is one of the foremost private investigators in the Arkansas area and offered his services for free at a time when the trio was hated for the supposedly heinous and cult nature of the murders, details which proved to be unfounded and completely inaccurate. In fact, it is Lax's work that helped lock down important DNA evidence making it hard for Terry Hobbs, the step-father of one of the victims, to avoid being held responsible for the murders, especially after witness testimony surfaced in the Sundance documentary. The Devil's Knot is directed by Atom Egoyan (Chloe) and written by Paul Harris Boardman and Scott Derrickson (both writers of The Exorcism of Emily Rose and Beware the Night), based on Mara Leveritt's book of the same name. The film follows the trial in the wake of the savage murders of three young children believed to be committed by three teenagers who ended up being wrongly accused of the crimes as part of a satanic ritual. 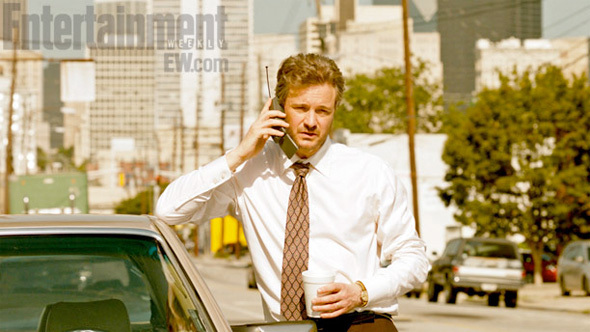 Colin Firth, Reese Witherspoon, Amy Ryan, Dane DeHaan, Stephen Moyer, Kevin Durand and Mireille Enos all star in the film premiering at TIFF 2013 this month, but does not yet have a release date.